There’s a new app out for your iPhone and Palm Pre from TripAdvisor! You can read millions of reviews and opinions of hotels, inns, and bed and breakfasts, and more. You can even add your own review. TripAdvisor is the world’s largest travel community – find it all fast! 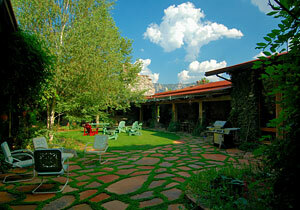 Read what our guests are saying about El Portal Sedona Luxury Inn on TripAdvisor. “After waiting almost 9 years to get married, we chose to rent out all the rooms at El Portal for our small, intimate wedding. The word most used by our guests about the entire experience was “perfect!” Every room at El Portal is amazing, yet differently decorated and unique. The service is always amazing..Steve, Connie, Terri, and Heather provided a relaxed atmosphere yet attentive to all our needs. The great room provided a beautiful setting for our ceremony. Food/wine were great! Breakfast is always amazing…the pumpkin muffins are the best! The fire pit in the courtyard every night provided an elegant campfire feeling for us to share with our family and friends.